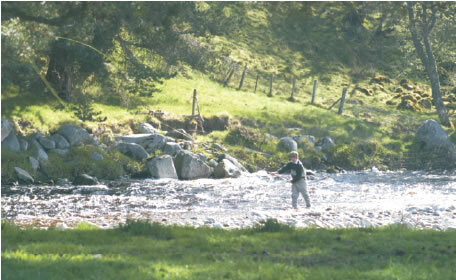 Many anglers consider Speyside a paradise. This is due to its fast flowing rivers, the availability of Atlantic salmon (the king of all game fish), in some of the most beautiful scenery in Scotland with the marvelous hospitality of its innkeepers. Many fishermen prefer to fish the Spey, staying in Grantown-on-Spey in one of its comfortable hotels, guest houses or B&Bs. The second largest River in Scotland is Spey which touches Grantown both geographically and in the composition of its name. The river is born in the Highlands above Loch Laggan which lies 20 miles southwest of Grantown. Little more than a creek at it’s inception it gains in force as it is fed by many burns that drain water from the surrounding hills. It is one of Scotland’s great rivers for salmon fishing and runs between the towering Cairngorms on the east and the Monadhliath Mountains on the West. The Spey has a massive catchment. Its level is influenced by steady snowmelt through to the summer months and low water is rarely a problem. Even when the river runs low in mid- summer there will always be a steady run of summer salmon and sea trout. 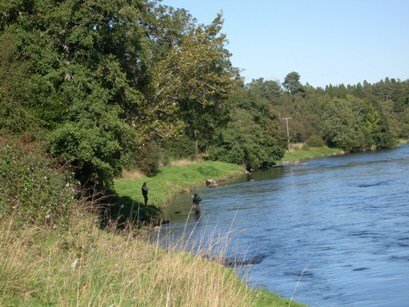 Grantown-on-Spey provides a brilliant base to enjoy angling on Speyside. Within striking distance of the village, one can access beats for the experienced fisherman as well as lochside instruction for beginners. Careful planning, with help from local angling shops about the recent catches and river levels will hopefully pay dividends for every level of skill. Not only does the Spey River offer a great variety of fishing but the Rivers Avon, Findhorn and Dulnain are also excellent rivers for angling in their own right. In addition, there is a variety of trout, char and pike in nearby lochs and more remote hill lochs. Whether using fly or bait, or fishing from boat or bank there is something to suit everyone. Nearby fisheries also offer stocked lochs for the beginner to learn and practice. Fishing on Speyside has never been easier. It is both accessible and affordable. Information is readily available by internet, local sporting shops and private estates and fisheries. Prices can vary considerably, but with a little preparation the fishing experience can be a pleasure to anyone with the interest.